I really like this aesthetic, I wish you good things! this looks so much fun! I love your art style. Thank you both so much :D really warms me to hear such nice feedback! It shows potential combinations of start dates and end dates. June 29th is Nightdive Studio's scheduled Kickstarter launch for System Shock Remastered. An action RPG called UnDungeon, a tactics RPG called Spinal Blast and a 2D puzzle platformer called Colored: The Other Dimension are preparing campaigns for sometime within the next few months. An English localization of Sharin no Kuni is preparing its campaign for late June. A foreign language game called Rhoots may launch soon. For AAA game releases there isn't much worth noting in July. August 23rd has both Deus Ex Mankind Divided and King of Fighters XV. World of Warcraft's Legion expansion is August 30th. ReCore is September 13th. Persona 5 is September 15th. Final Fantasy XV is September 30th. For big movies Star Trek Beyond is July 22nd and Suicide Squad is August 5th. Canada Day is July 1st. Independence Day is July 4th. San Diego Comic-Con is July 21st to 24th. Gamescom 2016 is August 17th to 21st. Gamescom has now grown to be like a miniature E3 for how much attention it gets. August 31st to September 1st is PAX Dev. September 2nd to 5th is PAX West. Tokyo Game Show is September 15th to 18th. Hi LobsterSundew - thank you so much for the information on dates - that's amazingly helpful information. Sorry for the delay in my reply, I didn't get a notification. It looks like on your table there's no 'good:good' dates upcoming, but a fair amount of 'okay:good' or 'good:okay'. Do you think, by your measures, it's more important to start or end on a 'good' date? I intuitively feel that it might be better to start on a good day so as to get some momentum - but that's more of an anecdotal feeling - what do you think? The easiest times to run a video game Kickstarter campaign for 2016 are likely already gone. Months like April and May can be far easier than July and August. A lot of it has to do with times of the year when small indie games have an easier time getting press coverage due to a lack of AAA game releases. That doesn't mean there aren't very good times to run left. It is also possible for projects with very low minimum funding goals to get funded almost any time of the year (except potentially November and December). Sometimes an okay time to run is the best a campaign can get without postponing for a long time. It gets very complicated after the month of June because of holidays, AAA flagship game releases, conventions and the superstar projects from famous developers. It becomes a much denser minefield to navigate. The first half of the year is simpler in this regards. Another problem is that July and August can get flooded with low effort campaigns from people that decided to use their vacation time to launch a Kickstarter project. With proper planning it is still very possible to get funded in summer, but the difficulty is elevated. The final-48-hour-surge is when many campaigns achieve their strongest "velocity" for pledges. The reminder e-mails and sense of urgency help encourage pledging. This period of time is precious. 30% of the funding may easily come from it. In my experience I place far more importance on the deadline being well scheduled. It is still very important to try to launch at a good time, so the campaign doesn't immediately stall, but there are ways for a campaign to be claw its way to success after a bad launch. A bad deadline easily harms the chances of reaching the minimum funding goal and the potential for how much pledge upgrading happens if overfunded. Bad timing usually boils down to fewer people being around for the final countdown. This means fewer people to help a campaign if it is just close enough to a funding goal. Fridays, Saturdays and Sundays are bad for both launching and ending on. Many office workers have a Monday to Friday workweek. People spend their weekends off in different ways. Expect fewer people online on weekends. Many project creators begin to dread the slowdown weekends can bring. Journalists can wait until Monday to look through their inboxes. Let's Players can be uploading content prepared in advance instead of working on weekends. Politicians and corporate CEOs can send out press releases with bad news on a Friday because they know fewer people will be expected to read them. Thursdays aren't the best to launch on because it wastes some of the valuable first 48 hours on a Friday, but Thursdays do improve when considered as a time to end. Thursdays can also sometimes be slow for news. News sites are more likely to cover an indie game when there isn't AAA gaming news. Mondays to Wednesdays can get the good traffic. Projects launching on Monday need to do more work during the previous week trying to get press coverage arranged for the launch. Journalists' inboxes are often the most full on Monday, so stuff gets immediately dismissed easier. Ending on a Monday also risks many of the last 48 hours reminder e-mails getting buried in the weekend backlog of inboxes. Kickstarter previously only worked in increments of 24 hours for scheduling. The hour-of-the-day a campaign launched became the hour-of-the-day that it was scheduled to end. I watched so many campaigns launch early in the morning and ruin their final day's performance because they ended when the majority of potential backers would still be asleep or commuting to work. Ending in the afternoon/evening for North Americans works the best. Many times in the past a decision was made to intentionally risk harming the launch day by launching late at night so that there could be much more useful hours on the final day. Kickstarter now has the feature to set the deadline hour independently of the launch hour, so the sacrifice of valuable hours on the launch day no longer has to happen. Campaigns can now much more easily launch on a Monday morning instead of having to resort to launching on Sunday night. The first and middle weeks of a month can also better performing for campaigns. There is speculation this is do to with office workers getting their wages deposited into their bank accounts and when utilities/rent need to be paid. In the past there have been backers that comment how they would otherwise have upgraded a pledge higher if the campaign hadn't ended before payday. The first week of a new month also brings in a fresh wave of the highest quality projects the category may see for that month. The biggest campaigns are also important factors in scheduling. System Shock's campaign ends on Thursday July 28th. Prey For The Gods ends on Friday August 5th. Large campaigns can draw lots of traffic to the Kickstarter category when they are in their final countdowns. In some years, but not all years, a good window to launch opens up in the second half of August. There can be a dry spell with so few high quality projects around that anything that looks competent can grab the attention of the frequent Kickstarter backers. While there can be a lot of crowding due to so many low effort projects launching, the high quality projects that float to the top in the rankings can still do well. Whenever Kickstarter itself has expanded to a new region, like Kickstarter UK, the result has been what I call a "meat-grinder". Developers that previously couldn't easily launch on Kickstarter rush the platform and competition in the category becomes as fierce as it gets. Good pre-launch marketing can help overcome bad timing. Large projects from famous developers with poor timing are still able to usually overcome that poor timing because they have such large followings already. There are ways to estimate how many backers a campaign will need to reach 15% or 30% of its goal amount. More estimates can look at how many followers a game already has and provide an idea of how many may convert into being backers. Campaigns also benefit from concentrating backers into the first few days of a campaign. A $10 backer on the first day can be more valuable then a $10 backer in the middle of a campaign's run. Successful Kickstarter campaigns are often about tipping towards success after a campaign reaches the critical mass it needs. If a campaign fails to get enough traction at launch, it will often be met with apathy by both potential backers and members of the press. A statistical tipping point to aim for is trying to get over 30% funded before halfway through the campaign's run. LobsterSundew, that was an incredible reply. That's given me a lot to think about, it's fantastically detailed advice - it's going to take me a few reads to be able to make the absolute most of it. Thank you. I will post some of my thoughts on what days I will launch and finish the campaign quite soon. In other news, I've been experimenting the last couple of days with how to get the most out of trying to record 1080p footage on my 10 year old laptop. I'm super excited that I've just managed to render a good quality video; here's the test footage! New trailer is finally on the way! So, I wrote a blog post last month but forgot to post it. Nice. Here it is! The story has moved on a little since then, I'll type out what's happened since and follow up soon. For the launch of my Kickstarter, I need a stand-out project video. This could be the first and last impression for many people, so I want this to represent SUPER MEGA BEST CAT ADVENTURES as well as I can - showcasing the gameplay and artistic direction in the best possible light. From the last trailer I made, I learnt two key things; record at the best resolution possible, and check your production pipeline from end to end before recording and editing the whole trailer. Last time, I had the horrible realisation afterwards that the quality wasn't as good as I thought, which was very frustrating. This time, I tested the process from start to finish - recording, cutting, editing, exporting, and then uploading to Youtube. I was very happy to see that I was able to capture, edit, and upload 1080p video. My laptop is around 9 years old, so I didn't know if I'd be able to get this footage at all. Getting there! There are still quite a few artefacts, so somewhere in the pipeline I was losing quality. Good to catch this at the beginning! UNFORTUNATELY: my computer did not like this. The video card has given up. I wrote this post from my work computer, which I am very grateful to be able to use; but it has an even worse video setup than the other machine and there is no way for me to capture good footage from it. I'm not quite sure what to do now. One thing that is for sure is that this is going to delay things. 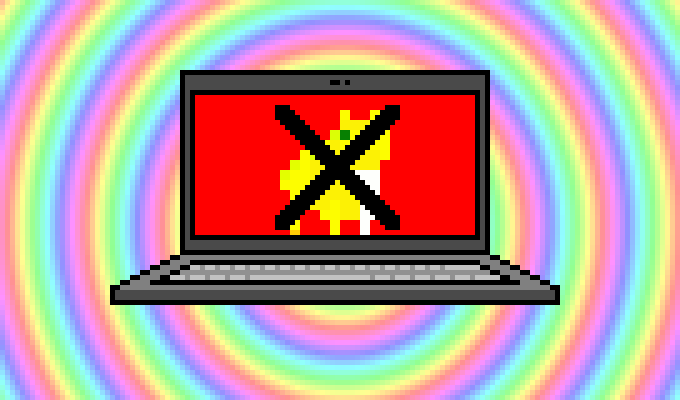 My last blog post told the woeful story of my development laptop dying an ungraceful death. The laptop served well, and gave a very respectable number of years of service. I'm back up and running now, luckily without having to pay to get the laptop repaired (not worth it), or buying a new development machine (can't afford it). Fortunately, my work provide me with a laptop - a Thinkpad T420s. This is a fantastic machine, and having it has been my salvation. The specs on it are better than my old laptop (HP Pavillion dv6700), though it doesn't have a dedicated graphics card, the specs are a bit more beefy. Passmark scores the CPU with over twice the rating, and the integrated Intel GPU comes in at nearly 4 times the rating. I had no idea that this machine was potentially so much better. My perception of it had been shaped by my assumption that the integrated graphics card would be less performant, and also because I use Linux (Debian) on it for work, and had never managed to configure it correctly to utilise the graphics chip. So this was quite the surprise! The ThinkPad T420s had no DVD drive, but it did have the empty drive bay. I picked up a 2nd hard drive caddy from Amazon and slapped my old Windows hard drive in there. Pressing F12 on booting the laptop brings up the boot menu so I can choose which HDD to boot from, so I can keep all my work stuff in place and then reboot into my game development machine as and when I need it! This is like a dream come true! I recommend the HD caddy linked above, it fit perfectly into the 9.5mm bay on this machine, and was beveled to match. The HD feels very snug and secure. So, what was my original recording setup? Laptop to TV: to make sure that the output was 1080p (laptop was not). Display duplicated to Elgato, to also record in 1080p. Elgato connects back to the computer to save the video. Fine. Now, with my original hard drive in the new computer, I've piped the single VGA out into a splitter, which in one direction goes to the TV as VGA and establishes my 1080p output. The other cable from the VGA splitter goes into an HDMI converter, which goes to the Elgato. 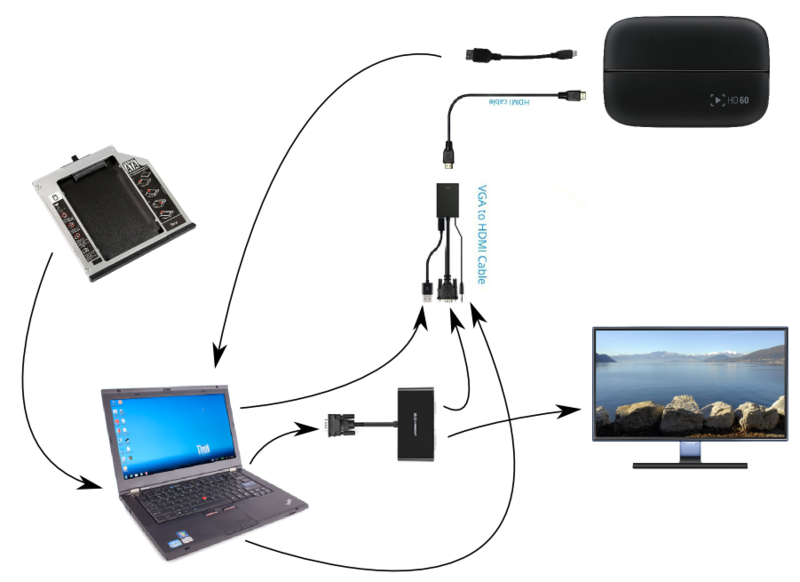 The VGA to HDMI converter has an audio jack so that you can also carry sound, which VGA cannot do. So, a little more complicated - but it works great! 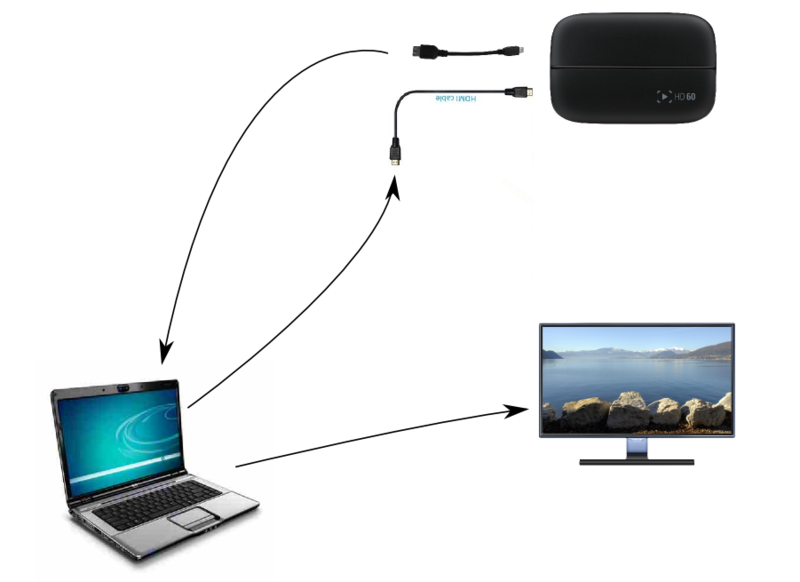 I used this VGA splitter and this VGA to HDMI converter. Both seem to be well made and good value. You can see that the recompression applied by YouTube still left the video with artefacts - there's a lot of fast moving content, and understandably their algorithm loses some of the video fidelity in such situations. After hours of testing different formats, I came across a post someone had made saying that if you upload a video at 4K resolution, YouTube reencodes the video at a higher bitrate - so instead of being around 5-9Mbps we're looking at 15-20! Sounds great! The '-vf scale' operator sets the target resolution to that of 4K video, and the '-sws_flags neighbor' setting is to tell ffmpeg to the use 'nearest neighbor' algorithm when scaling, ensuring we keep our crisp, sharp pixels. OK, now we are getting somewhere. This looks a lot better. One small problem remains - the colours are not as rich and vibrant as in the game itself. Looking at the captured footage, this seems to have been due to some configuration at the time of recording, so I'm going to experiment with the capture settings a little more and hopefully record the game in it's full over-saturated glory. Nearly there! Maybe one day I'll actually be able to work on the game again! The trailer is coming on - I've captured a good amount of footage so far, and started cutting it down to size. I'd estimate that I've got about 20 seconds of it cut to good clips so far. Bit more to go! I also tried out a shader made by MuddyMole from the Clickteam forums - a very easy to implement shadow caster! Looks really sweet, I can already think of a couple of fun ways to integrate it into the game. Just wanted to say that i love how crazy this thing looks. Thanks Dorobo! Means a lot to me that you like it, I hope you like the look of the new trailer - it's pretty crazy too! I've finished the most of the Kickstarter text - just tweaking left which I expect to finish this morning. There's 1 image left to edit, and I've finally cut and edited the video. I used a rough cut of a track sent over by my musician as a placeholder for now. When I've finished everything today I'm going to submit the project for approval by Kickstarter. It takes approx 2-3 days for them to approve it, so we should be able to go live very soon! When I've got a new version of the music I'll edit that back into the video, and then I'll re-upload it - apparently this is a fine thing to do, and it's possible to change the content of the project page at any time. Here's a small drawing I shared on twitter the other day that showcased my exceptional skills at being able to draw on my phone whilst on the london underground. I did this after cutting together some of the clips for the trailer on a laptop whilst on a long bus trip. Exciting news everyone - Super Mega Best Cat Adventures is ready to launch on Kickstarter! I'm planning to also launch my Greenlight campaign at the same time as hopefully they'll both drive each other's traffic up. It means that I'm probably going to go crazy because it's a bit of a push! Trailer is dope congrats with the kickstarter! So how do you decided it's time for a kickstarter.. what was the trigger? Thanks Dorobo, though the trailer on Page 1 is my old one - I've got a brand new one made that hopefully you'll like a bit more! I'm going to spend a lot of time over the next month trying different methods of promotion and hoping that the right people get to see the project! Things are very close now, I'm getting nervous! Re: SUPER MEGA BEST CAT ADVENTURES: Kickstarter Live Now! I am nervous and excited! It feels quite overwhelming! Oh, and live on Greenlight too!! Good luck with your kickstarter, gonna back it up this weekend! Thanks so much csg! 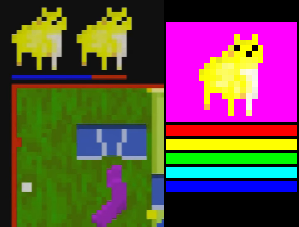 Llamatron was a big inspiration, I loved it so much I built an arcade machine once and put only that game in it Felt so good with big joysticks! You could add the KS and GL links to your signature line for easy reference. Comparing the current KS and other trailers, I prefer the other one. The KS trailer primarily shows "more of the same" after the first minutes that doesn't seem to add much. Also, it doesn't go into more details regarding the game. Seems like all you do is shoot and move around to avoid the enemies. Mentioning the main game aspects would be useful for people who see the video for the first time and may not notice things - especially in the chaotic action. For example, additional challenges such as the giant giraffe legs, approaching train, holes in the ground and but more importantly the exploration aspect could be mentioned. If relevant, it could be better to see a "Story Trailer" that answers the "Why?" i.e. what is the main character's motivation to do those things. Might make a difference for some.